Simple, but the best things in life usually are! Rock cakes are amazing because of that subtle spiciness, oooh it's like Christmas. They look so rustic and homely and I just want to make a cup of tea when they come out the oven and eat them all up while they're still warm and fresh. Sieve the flour into a bowl (well, you can if you like, who am I kidding, I never sieve) and rub the margarine in with your fingers until the mixture resembles fine breadcrumbs. Stir in the baking powder and mixed spice, sugar and raisins. Mix in the milk to form a dough. Resist the urge for perfection and neatness... tricky I know... and heap the mixture in mounds onto a greased baking tray - this achieves the rustic look, I find it a hard one to perfect. Sprinkle the tops with sugar, a bit of granulated if you have some handy as it gives that nice crunch on the top. Bake for about 15 minutes at 190⁰C or until you've achieved that nice golden brown top. See, that simple. And deeeeeeeeeeeelish. I have just made these and i have to say they are lovely - thanks for the recipe, its now in my favourites. Excellent Recipe. 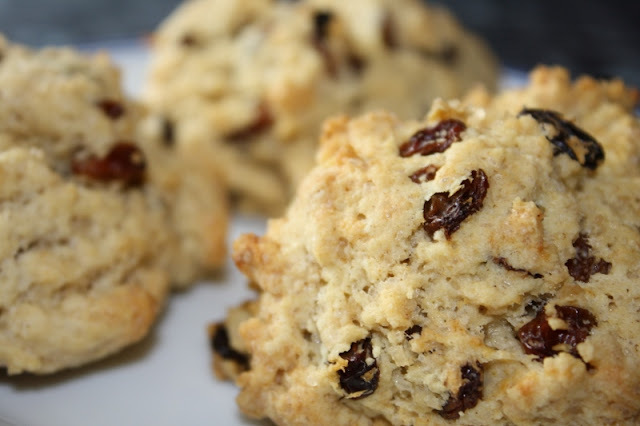 All the rock cakes eaten and people at work were asking for the recipe! (Non vegans) I used both mixed spice and cinnamon and sifted the flour. Used granulated sugar too. Top Recipe thanks. I used wholewheat flour, dark muscovado sugar, vegan butter and increased the almond milk. My first vegan scones recipe, really delicious. Excellent! I used soft brown sugar, added some dessicated coconut and sprinkled with demerara sugar. Light, crunchy, delicious. Many thanks.